Insurance Fraud Lawyer in SeattleCoverage fraud occurs when someone tries to take money from an insurance company through deception. It is usually motivated by financial gain, but if caught, you could face serious consequences. Many people think of coverage sharp practice as harmless, but the truth is, it raises the cost of insurance for everyone and is a serious crime in Washington state. In fact, residents of Washington are even encouraged to report insurance sharp practice in exchange for a reward if the accused is charged and convicted. Insurance fraud is the intentional falsification or omission of information regarding an insurance claim, premium, or application. Coverage fraud can also apply to issuing fake insurance policies or rate-fixing. You may be charged with coverage fraud if you conspire to do any of the above, even if you did not actually succeed at defrauding the insurance company. Consumers, providers, insurance companies, adjusters and other individuals can all be charged with insurance fraud. Coverage fraud is typically broken down into categories: hard fraud and soft fraud. Hard fraud is when the accused fakes an accident, injury, theft, arson or other loss, takes out a life coverage policy on someone with the intention to kill that person, all for the purpose of collecting money from an insurance company. Soft fraud, on the other hand, occurs when the accused inflates the value of a stolen item or claims that damage occurred because of an accident when the damage actually existed prior to the accident. For example, an individual claiming to the insurance company that his car’s bumper was damaged during an accident when it was actually damaged prior to the accident occurring is soft sharp practice. This type of sharp practice is usually thought of as an opportunistic crime. The exact charge and the potential penalties for coverage sharp practice depend on the amount of money involved and the other details of the alleged crime. In some cases, you could also face federal charges which carry much more severe types of consequences than state charges do. Federal authorities can prosecute coverage sharp practice under a number of different statutes including mail fraud or criminal racketeering. Besides the criminal penalties that you may face, the victim could also bring you to civil court in an attempt to win restitution from you. This means that if you are charged of sharp practice, you could face jail time, fines and also owe restitution. Even if you are not found guilty of fraud, the victim can still bring you to civil court. If you are charged and/or convicted of coverage sharp practice, family and friends could turn their backs on you. You also may find that it is difficult to find employment with an coverage fraud conviction on your record. Employers will view you as untrustworthy and dishonest and not want to risk being defrauded by you. This is especially true when you are convicted of insurance sharp practice relating to workers’ compensation or unemployment coverage, since these deal with workplace related matters. 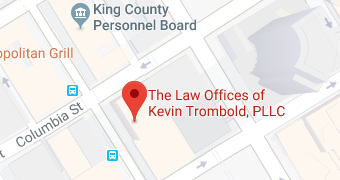 If you’re accused of coverage sharp practice in the Seattle area, contact the Law Offices of Kevin Trombold quickly. Insurance fraud attorney Kevin Trombold has more than two decades of experience representing defendants who have been charged with white-collar crimes including embezzlement, forgery, and coverage fraud. If the prosecution cannot prove these elements of coverage sharp practice, then the defendant cannot be convicted. If you or someone you know has received a charge with coverage fraud, it is essential that you contact a Seattle insurance fraud attorney as soon as possible. In the most serious coverage sharp practice cases, a conviction is punishable with a lengthy prison sentence. If you are charged with car insurance fraud or health coverage sharp practice, you may have made a simple mistake or there may have been a simple misunderstanding. If you did not knowingly or intentionally defraud an insurance company, your attorney can explain what happened and may be able to have charges dropped or arrange a settlement agreeable to all parties. If the prosecution’s case against you is overwhelming, and you are convicted, experienced Seattle insurance fraud attorney Kevin Trombold will negotiate for alternative sentencing that could include work release, community service, and “house arrest.” If you’re accused of coverage sharp practice or any other white-collar crime in the Seattle area, call the Law Offices of Kevin Trombold. If you’ve been charged with insurance sharp practice, let attorney Kevin Trombold work their magic for you. A coverage fraud charge can ruin your reputation. Criminal defense attorney Kevin Trombold and his legal team work strategically and in-depth to make sure you get the best possible outcome with your case. Contact the Law Offices of Kevin Trombold by calling us at 206-382-9200 for a consultation.